Living things are highly organized and structured, following a hierarchy of scale from small to large (Figure 1). The atom is the smallest and most fundamental unit of matter. It consists of a nucleus surrounded by electrons. Atoms combine to form molecules, which are chemical structures consisting of at least two atoms held together by a chemical bond. In plants, animals, and many other types of organisms, molecules come together in specific ways to create structures called organelles. Organelles are small structures that exist within cells and perform specialized functions. As discussed in more detail below, all living things are made of one or more cells. In most multicellular organisms, cells combine to make tissues, which are groups of similar cells carrying out the same function. Organs are collections of tissues grouped together based on a common function. Organs are present not only in animals but also in plants. An organ system is a higher level of organization that consists of functionally related organs. For example vertebrate animals have many organ systems, such as the circulatory system that transports blood throughout the body and to and from the lungs; it includes organs such as the heart and blood vessels. Organisms are individual living entities. For example, each tree in a forest is an organism. All the individuals of a species living within a specific area are collectively called a population. A community is the set of different populations inhabiting a common area. For instance, all of the trees, flowers, insects, and other populations in a forest form the forest’s community. The forest itself is an ecosystem. An ecosystem consists of all the living things in a particular area together with the abiotic, or non-living, parts of that environment such as nitrogen in the soil or rainwater. At the highest level of organization, the biosphere is the collection of all ecosystems, and it represents the zones of life on Earth. It includes land, water, and portions of the atmosphere. Close your eyes and picture a brick wall. What is the basic building block of that wall? It is a single brick, of course. Like a brick wall, your body is composed of basic building blocks and the building blocks of your body are cells. Your body has many kinds of cells, each specialized for a specific purpose. Just as a home is made from a variety of building materials, the human body is constructed from many cell types. For example, bone cells help to support and protect the body. Cells of the immune system fight invading bacteria. And red blood cells carry oxygen throughout the body. Each of these cell types plays a vital role during the growth, development, and day-to-day maintenance of the body. In spite of their enormous variety, however, all cells share certain fundamental characteristics. The microscopes we use today are far more complex than those used in the 1600s by Antony van Leeuwenhoek, a Dutch shopkeeper who had great skill in crafting lenses. Despite the limitations of his now-ancient lenses, van Leeuwenhoek observed the movements of single-celled organism and sperm, which he collectively termed “animalcules.” In a 1665 publication called Micrographia, experimental scientist Robert Hooke coined the term “cell” (from the Latin cella, meaning “small room”) for the box-like structures he observed when viewing cork tissue through a lens. In the 1670s, van Leeuwenhoek discovered bacteria and protozoa. Later advances in lenses and microscope construction enabled other scientists to see different components inside cells. By the late 1830s, botanist Matthias Schleiden and zoologist Theodor Schwann were studying tissues and proposed the unified cell theory, which states that all living things are composed of one or more cells, that the cell is the basic unit of life, and that all new cells arise from existing cells. These principles still stand today. There are many types of cells, and all are grouped into one of two broad categories: prokaryotic and eukaryotic. Animal, plant, fungal, and protist cells are classified as eukaryotic, whereas bacteria and archaea cells are classified as prokaryotic. A prokaryotic cell is a simple, single-celled (unicellular) organism that lacks a nucleus, or any other membrane-bound organelle. We will shortly come to see that this is significantly different in eukaryotes. Prokaryotic DNA is found in the central part of the cell: a darkened region called the nucleoid (Figure 1). Figure 2. This figure shows the generalized structure of a prokaryotic cell. Unlike Archaea and eukaryotes, bacteria have a cell wall made of peptidoglycan (molecules comprised of sugars and amino acids) and many have a polysaccharide capsule. The cell wall acts as an extra layer of protection, helps the cell maintain its shape, and prevents dehydration. The capsule enables the cell to attach to surfaces in its environment. Some prokaryotes have flagella, pili, or fimbriae. Flagella are used for locomotion. Pili are used to exchange genetic material during a type of reproduction called conjugation. Fimbriae are protein appendages used by bacteria to attach to other cells. A eukaryotic cell is a cell that has a membrane-bound nucleus and other membrane-bound compartments called organelles. There are many different types of organelles, each with a highly specialized function (see Figure 3). The word eukaryotic means “true kernel” or “true nucleus,” alluding to the presence of the membrane-bound nucleus in these cells. The word “organelle” means “little organ,” and, as already mentioned, organelles have specialized cellular functions, just as the organs of your body have specialized functions. At 0.1–5.0 µm in diameter, most prokaryotic cells are significantly smaller than eukaryotic cells, which have diameters ranging from 10–100 µm (Figure 3). The small size of prokaryotes allows ions and organic molecules that enter them to quickly spread to other parts of the cell. Similarly, any wastes produced within a prokaryotic cell can quickly move out. However, larger eukaryotic cells have evolved different structural adaptations to enhance cellular transport. Indeed, the large size of these cells would not be possible without these adaptations. In general, cell size is limited because volume increases much more quickly than does cell surface area. As a cell becomes larger, it becomes more and more difficult for the cell to acquire sufficient materials to support the processes inside the cell, because the relative size of the surface area through which materials must be transported declines. Figure 3. This figure shows the relative sizes of different kinds of cells and cellular components. An adult human is shown for comparison. Figure 4. An example of a typical animal cell. Figure 5. An example of a typical plant cell. Despite their fundamental similarities, there are some striking differences between animal and plant cells (Figure 3). Animal cells have centrioles, centrosomes, and lysosomes, whereas plant cells do not. Plant cells have a rigid cell wall that is external to the plasma membrane, chloroplasts, plasmodesmata, and plastids used for storage, and a large central vacuole, whereas animal cells do not. From an ecological perspective, chloroplasts are a particularly important type of organelle because they perform photosynthesis. Photosynthesis forms the foundation of food chains in most ecosystems. Chloroplasts are only found in eukaryotic cells such as plants and algae. During photosynthesis, carbon dioxide, water, and light energy are used to make glucose and molecular oxygen. One major difference between algae/plants and animals is that plants/algae are able to make their own food, like glucose, whereas animals must obtain food by consuming other organisms. Figure 6. This simplified diagram of a chloroplast shows its structure. 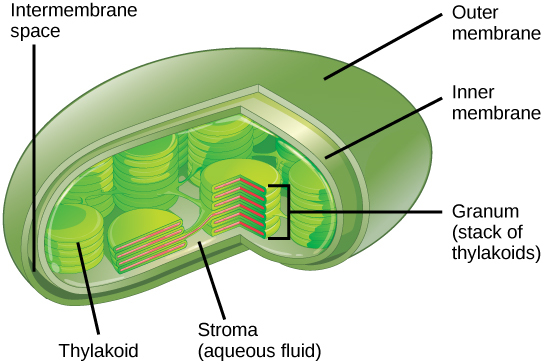 Chloroplasts have outer and inner membranes, but within the space enclosed by a chloroplast’s inner membrane is a set of interconnected and stacked, fluid-filled membrane sacs called thylakoids (Figure 4 below). Each stack of thylakoids is called a granum (plural = grana). The fluid enclosed by the inner membrane and surrounding the grana is called the stroma. Each structure within the chloroplast has an important function, which is enabled by its particular shape. A common theme in biology is that form and function are interrelated. For example, the membrane-rich stacks of the thylakoids provide ample surface area to embed the proteins and pigments that are vital to photosynthesis. “Essentials of Environmental Science” by Kamala Doršner is licensed under CC BY 4.0. 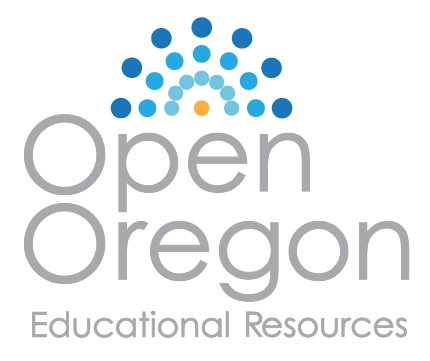 “Levels of Organization of Living Things” by Open Stax is licensed under CC BY 4.0. Modified from the originals by Matthew R. Fisher.